Retrieve a legendary artifact to fulfill an old alchemist's wish in Windhelm. Talk to Nurelion in his Windhelm store. Retrieve the White Phial from Forsaken Cave. Return the Phial to Nurelion. Talk to his assistant, Quintus Navale, for your final reward. "Master, you're far too old for this sort of journey." Quintus: "Master, you're far too old for this sort of journey. We don't know what's inside..."
Nurelion: "I'll... I can... just..."
Quintus: "You see, you're not well! Have a seat and I'll fetch you some tonic." Nurelion: "Bah. If there was a tonic that could help me, I would have found it by now..."
After the discussion, Nurelion will take his place behind the counter and Quintus will walk away. Ask Nurelion what the argument was about and he will explain: "Just a man's life work, is all. I've finally derived the location of the White Phial, but this doting busybody won't let me get it." He is obviously referring to Quintus, but offer to help him find whatever he is looking for and he will provide some background information: "It's buried with its maker, Curalmil, in a long forsaken cave to the west of here. Curalmil was a crafty one, even in death. You would need the skills of a master alchemist to reach his resting place. Luckily for you, I've already made the mixture." He will then hand you his mixture and add a marker to your map. He will then explain that the White Phial is a legendary bottle, forged in the days when Skyrim was just starting its turn to ice. He then tells you he spent his entire life searching for it, in libraries and small villages, researching its location, and will explain the name of his store: "I even named my shop after it, hoping that it might attract anyone who had heard of it. And now it's within my grasp... but the Eight, it seems, have chosen me for their amusement.... for in my current condition, I'll never be able to lay my hands on it." The map marker leads to Forsaken Cave, a cave west of Windhelm, straight south of Alftand. Enter the premises and head down the icy slope to the east. 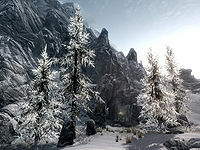 Kill the leveled wolves or snow bears as you go along and open the door to the west, leading to a cave inhabited by draugr enemies. A tempting chest will be visible in a tunnel as you go along, but beware of the pressure plate triggering a dart trap above the chest. After a while, the surroundings will change into catacombs and more draugr will be revived and attack. Fight your way through the many tunnels and keep an eye out for a copy of the quest-related tome The Mirror near a locked door leading to a chest with minor loot. The large northwestern room has three flame sprout traps and a hidden chest just before the next tunnel. Beware of yet another pressure plate triggering a battering ram and pick up some useful potions and ingots from the shelves before entering Forsaken Crypt. You enter the crypt to the sight of a large room in two levels, with an overhanging bridge above. Locate the narrow tunnel to the northeast and make your way upstairs through more draugr-infested catacombs. As you cross the bridge, beware of the leveled draugr attacking you then claim the contents of the chest and shelves on the other side. The next room contains two draugr and a huge ceiling spike trap in the center. Open the iron door and cross the bridge then fight your way through more draugr enemies until you reach another iron door with swinging blades on the other side. The room is large and contains the familiar chant from a word wall, but, as you enter, the leveled draugr boss Curalmil will burst out of his sarcophagus and attack, along with several leveled draugr enemies. Dispose of them all and find the word wall for a word related to the Marked for Death shout and a boss-leveled chest. Find the tunnel leading west behind the sarchophagus and place Nurelion's mixture in the ancient bowl at the end. 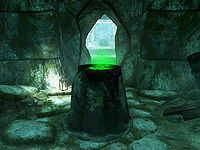 This lowers the stone wall in front of you and you will have free access to the final chamber which contains a variety of different alchemy ingredients and the Cracked White Phial, the item Nurelion spent a lifetime searching for. Back in The White Phial, Nurelion's poor health has taken yet another turn for the worse, forcing the old proprietor to sit in a chair around the clock with Quintus Navale in charge of the merchant services. Enter the private quarters upstairs and show Nurelion the cracked Phial. Understandably, this will make him quite upset: "This... it matches every description of the Phial that I've found in lore. But if it can't hold liquid, there's no way of knowing. How did you manage to damage it, then? This is what I get for not retrieving it myself." When you tell him that it was broken to begin with, he will become disparaging: "Figures—I doubt you have sufficient knowledge to harm the Phial even if you wanted to. Either way, this is the end of it. Now if you'll excuse me, I'm not quite in the mood to entertain guests. I trust you can show yourself out. Here's for your trouble." He then hands you a rather lousy reward of five gold, and then goes directly to bed, where he will stay 24 hours a day, obviously dying from his terminal illness. Leave him and head downstairs where Quintus will be eager to talk to you: "I want to thank you for your help. I know my master can be a bit short at times." He will then make up for his master's cheapness and hand you an additional five hundred gold, then go to watch over his master upstairs. However, there's still hope. A few days later, you will receive a letter from Quintus, starting the quest Repairing the Phial. 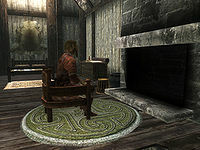 If you don't enter the White Phial the first time that you enter Windhelm, it may be possible that Nurelion will be already dying in his bed when you visit him later. The quest cannot be started and his apprentice will not be available as merchant. The Phial can disappear if you leave the dungeon without taking it. 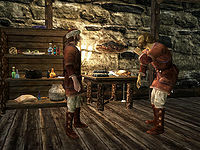 At the completion of the quest, even when "asleep and dying" on his bed, you can still hear Nurelion continuing his standard dialogue about not liking loiterers and those who gawk at his goods. It is possible to receive double the amount that Quintus gives you as a reward from 500 to 1000 gold. Often when you finish the initial dialogue with Nurelion too quickly (without exiting during middle of the dialogue), he will repeat the same dialogue if you do not exit the second dialogue, which would result in a duplication of the 500 gold rewarded. Quintus may not talk to Nurelion, making it impossible to start the next quest. 10 The alchemist of Windhelm, Nurelion, has asked me to find the legendary White Phial for him. 100 Finishes quest I retrieved the White Phial for Nurelion, but it was damaged beyond repair. His assistant, Quintus, still paid me my reward, though. On the PC, it is possible to use the console to advance through the quest by entering setstage MS12 stage, where stage is the number of the stage you wish to complete. It is not possible to un-complete (i.e. go back) quest stages, but it is possible to clear all stages of the quest using resetquest MS12. This page was last modified on 11 April 2019, at 01:05.